As development of the Amiga Tabor continues, so does the work on the Kickstarter-funded and Chaos Engine-inspired arcade shooter Tower57. In a development update posted on Tuesday, developer Daniel Mussener hints that the latest benchmarks shows that the Amiga Tabor has a lot more muscles than its critics previously has given it credit for. The figures pretty much speak for themselves, Mussener reasons, as the Tabor allegedly blows most of its competition out of the water. 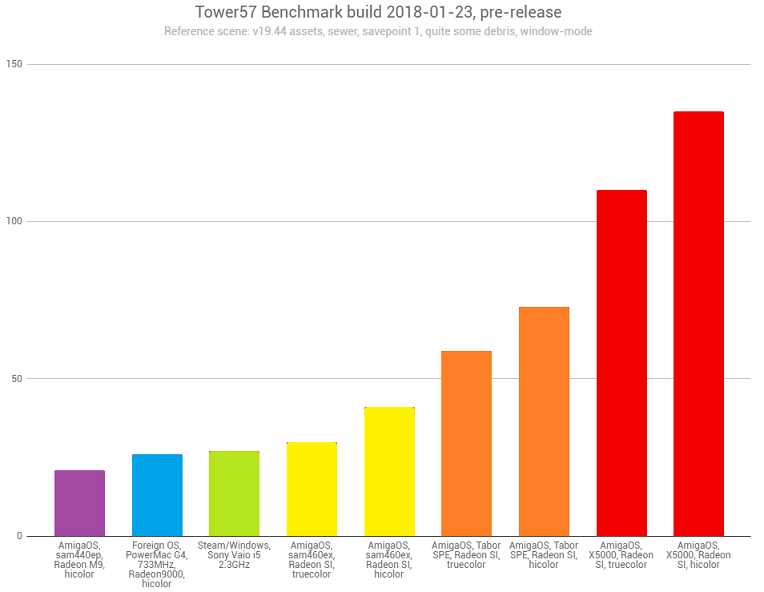 Like the graphics show and as Mussener emphasizes, the Tower57 build benchmarked on January 23rd running on the Tabor outperforms the Sam460ex by almost 100% when running in truecolor mode at 59 frames per second. Although that figure doesn't stand much chance against the Amiga X5000 workstation (running at 110 FPS), Mussener stresses that Tower57 on the Amiga Tabor runs at speeds more than twice as fast as it does on a Sony Vaio (laptop) with an Intel i5 CPU clocked at 2.3 GHz despite the Amiga version being, at least for the time being, fully rendered in software. 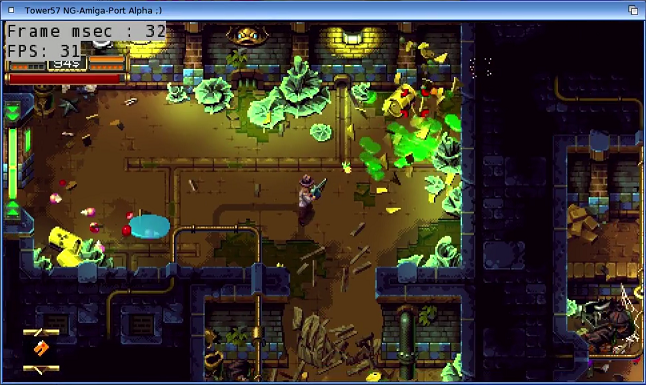 The most recent progress is reported to involve further optimization, with improved visual effects, procedural trickery and reduced loading times. At the time of writing, a firm Tower57 release date is yet to be set - Mussener does, however, target "early Q1 2018". If that promise holds water, expect to see Tower57 at your favorite Amiga retailer imminently. The release date of the Amiga Tabor itself, however, remains at this point unknown.